These dog days of August are the worst. The stultifying heat, the humidity - they sap all my strength away. French people do the sensible thing and go on vacation. I have no holiday plans on the horizon, so many weekends, I just want to sit on the couch and watch TV. And eat something cool and crunchy. While in one of these moods recently, I got to thinking that servers in Chinese restaurants did not always just plonk a plate of peanuts on the table. Many places would offer little plates of pickled cabbage too. If the restaurant was chi chi enough, there might be a couple of strips of carrot or cucumber, or slices of chilli. The crunch was incomparable and some restaurants got the balance of sweet and tart more right than others. My favourite ones were, inevitably, the shouty versions, equally sweet and tart. This is not a subtle pre-meal snack, but it does get the appetite going, especially in the heat. Heavy cooking this time of year makes no sense, so this week's recipe requires just heating up some pickling brine. I can enjoy the breeze that blows through my home as I work in the kitchen. It's not onerous work either, just the slicing of vegetables. I experimented with the pickling brine a few times and have settled on these proportions because they suit my palate. If you like your pickles less sweet and more tart, start with 200g of sugar and work your way up. Anything less and the pickles will not last as long. If you like them very tart, add a couple more tablespoons of vinegar. Tasting the brine allows you to adjust it to your taste. Remember to let it cool completely before using. My pickles are simple, like the ones in restaurants, but I add garlic for a kick. Feel free to throw caraway, coriander or celery seeds, or peppercorns into the brine after the heat is turned off. I also use the most basic vegetables: green or Beijing cabbage, carrot, Japanese cucumber, red chilli and garlic. They come together with verve and colour, but you can, of course, experiment with other vegetables. Purple cabbage would be interesting and so are little red radishes and purple carrots, although the colour tends to leach out of them after pickling. For storing, I use glass jars from Daiso, the chain of $2 shops. The squat jars are wide, which makes packing vegetables into them easy, and the twist on and off plastic covers are sturdy. There is no danger of them rusting either. Before you head to the store, root through your kitchen for glass jam or condiment jars, which are perfectly fine to use. Wash them carefully with hot, soapy water and dry completely before using. To squeeze out the water from the vegetables after salting, and for packing them into the jars, disposable plastic gloves are indispensable. Leave the pickles to sit in the brine and in the fridge for at least 24 hours before eating. Any earlier and they taste sort of harsh. In fact, the pickles are best, I find, from day three. I gobble them up very fast, but they will last up to three weeks in the fridge. Pick them out, always with clean chopsticks, and eat them with pretty much anything: sandwiches, fried rice or noodles or grilled fish. I have them alongside tamagoyaki, Japanese rolled omelette. Many times though, I just eat them as they are. It's too hot to do anything else. Place all the ingredients for the pickling brine in a medium saucepan set over medium heat. Stir until the sugar and salt have dissolved. Turn off the heat. Taste and add more vinegar, sugar or salt if needed. Let the pickle brine cool completely before using. Remove the outer layer of leaves from the head of cabbage. Cut the cabbage into quarters. Slice off the core from each piece and cut crosswise into 1.5cm-wide slices. Place the cabbage in a large mixing bowl or plastic basin, separating the leaves as you drop them in. Peel the carrots, slice on the diagonal and then cut into matchsticks pieces. Cut the cucumbers into quarters lengthwise, slice off and discard the core, where the seeds are, and slice on the diagonal. Mix the carrots and cucumbers in with the cabbage. Add the salt and toss the vegetables thoroughly. Let them sit at room temperature for 40 minutes. Halfway through that time, give the vegetables another toss. While waiting, slice the chillies on the diagonal. Peel and slice the garlic thinly. After 40 minutes, the vegetables would have released a fair amount of water (below) and are bendable. Rinse twice under running water. Grab a handful of vegetables, squeeze out the excess water and place the vegetables in a colander. Continue until all the vegetables are in the colander. Rinse out and dry the mixing bowl or plastic basin and place the vegetables back in it. Add the chillies and garlic, toss to mix thoroughly. 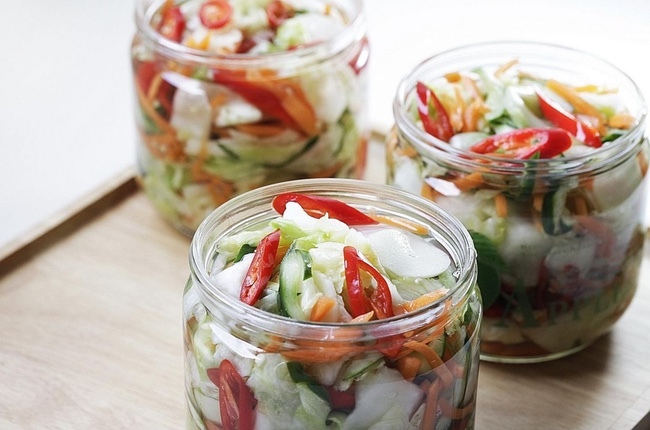 Pack the vegetables into clean glass jars. Ladle the pickling brine over the vegetables, making sure the vegetables are submerged. Cap the jars and refrigerate at least 24 hours before eating. Always remove pickles from the jar using a clean pair of chopsticks.